This is my kind of coupon deal. I wouldn't say I'm an extreme couponer, but I do like to save money on eating out. 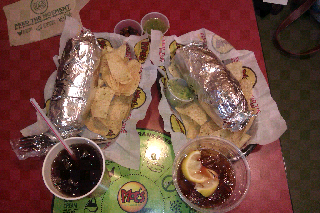 A friend and I went out to Moe's and we both had different sweet coupons...for all this food combined we paid a mere five dollars. Never underestimate the power of a purchased coupon book...it's contents, when properly utilized, far outweigh it's cost.